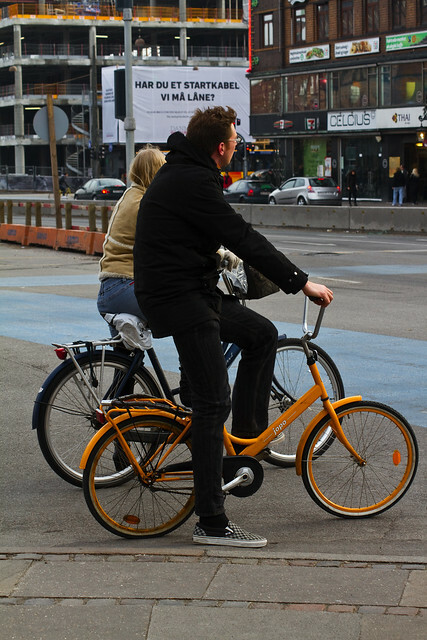 And a cool Finnish Jopo in Copenhagen. Nice pix. I like the yellow colored bike. Rockin' the iconic checkered Vans Shoes on a Jopo..What a cool name for a Bicycle company..
Love those Jopos (Jopot, since they're Finnish?). For 'Xander: actually, Jopo is just the brand name of the bike (from Finnish jokaisen polkupyörä, loosely "bicycle for everyone", a two-wheeled anser to "Volkswagen". The company's name is Helkama Velox. That should have been "answer" (blush). I like the sign above the guy's head. It asks "Do you have a starter cable we can borrow? ", right? Reminds me of people in cars who stop to ask me, on my bike, where there's a gas station nearby. Sorry, but the things barely register on my consciousness when I'm pedalling around: it's as if they're intrusions from a parallel universe to me. The anser is yes, that's the text on the sign. It's The Confederation of Danish Industry asking for help to kick-start the Danish economy. They are always focused on the auto sales growth, not the good parallel pedalling.